4th Annual Summer Issue Is Here! Fresh from the Issuu presses: the 2014 fourth annual summer online issue is here! The issue includes all of the genres you’ve come to expect from So to Speak: extraordinary fiction, nonfiction, poetry, and visual art. The editorial staff is happy to introduce you to the work of these feminist writers and artists and invites you to join the conversation. Read the new issue HERE or click on the cover art to the left. Then be sure to check back (great time to subscribe to the blog!) 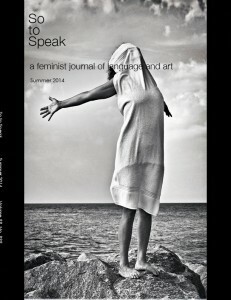 later this summer for posts by our contributing writers and artists, as well as guest writers, on craft and feminism. When you find a blog that resonates with you, engage with the writer via the message board, share the piece widely, and come back for more! Our blog aims to offer a platform for continuous dialogue on the challenges and successes of our feminisms, which can be found everywhere. So enjoy reading our latest summer issue, sharing your fave finds, and writing your own contribution to the worldwide dialogue of feminism in action–check out submission guidelines for our journal and blog!